Dress up or down? With jeans or dress pants? It's up to you to decide how best to wear this Ben Sherman versatile shirt. 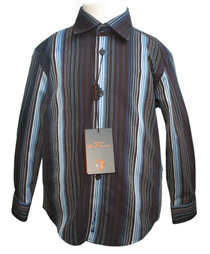 A rich, dark chocolate shade with fine vertical stripes of three shades of blue and white, this Wendell button shirt deserves a spot in your son's wardrobe, especially for a special occasion.